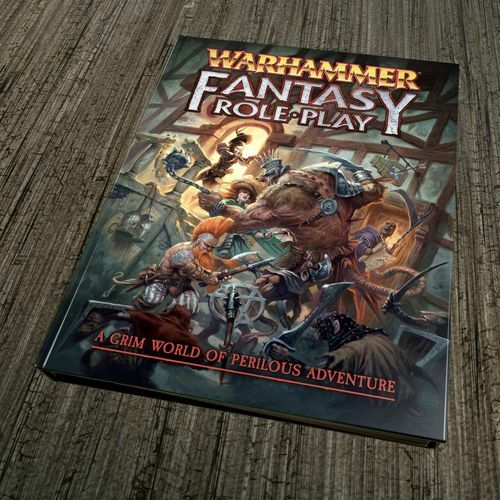 And winner of the most under-rated FRPG of all time is … Warhammer Fantasy RPG. No, really… I know it’s a somewhat bold statement, but I stand by it. OK… a bit of history to start off with … in 1983 Games Workshop – which had since 1975 sold RPGs and games produced by other companies – launched their own game, Warhammer, which was billed as a ‘mass combat fantasy RPG’. From its onset Warhammer appealed to younger gamers partly due to the game’s emphasis on table-top combat with miniatures rather than role-play, but also due to the fantasy aesthetic and game world being ‘dialled up’ to an extreme level. Older gamers in 1983 who were looking for an alternative to D&D were being drawn towards more ‘mature’ RPGs such as Runequest and / or Call of Cthulhu. Initially, Warhammer was seen by the gaming community as a kids’ game: a stigma that was to stick for some time. In 1986 Workshop began producing Warhammer in two forms: Warhammer Fantasy Battles, a miniatures wargame, and Warhammer Fantasy Role Play, which was.. erm .., fantasy roleplaying. It was at this point of division that WHFRP came into its own an won many fans amongst older players. The popularity of WHFRP was down to the game differing greatly from the table-top version, despite the RPG ostensibly taking place in same world as the wargame. The principal difference between the RPG and table-top version of Warhammer is that the fantasy aesthetic is not quite so ‘dialled-up’ in the RPG. In the RPG version the Old World game setting is both grim and humorous; it is a more down at heel, corrupt and decaying take on the standard fantasy version of medieval Europe that is the standard go-to setting of many fantasy RPGs. The specific focus in this game world is The Empire, a fantasy version of a late medieval Holy Roman Empire which is beset and undermined by both political corruption and the machinations of the sinister otherworldly forces of chaos. 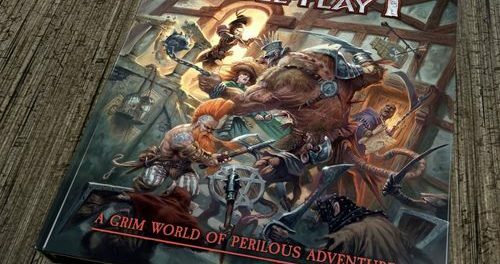 It is possible to run games of Warhammer FRP which pit players against fantasy creatures that include the usual suspects – orcs, goblins, trolls and so on – and game specific beasties such as the rather marvellous Skaven. However, due to both the political intrigue inherent in the game world and the slight spill-over into horror, it is perfectly possible to run games that are focussed more on conspiracy and investigations into dark mysteries. Indeed, a Warhammer FRP campaign can be as influenced by Alexander Dumas and H.P. Lovecraft as much as J.R.R. Tolkien and George R.R. Martin. In terms of mechanics, the game rules are based on a simple percentile system – not unlike Call of Cthulhu – which allows for fast paced play and exciting game sessions, rather than endless rules checking and chart referral. Also, characters take on a career rather than having a class, and may switch career with relative ease as a campaign progress. Your character may start as rat catcher, but there is nothing to prevent them becoming a wizard or joining a holy order of knights. Likewise, your character may begin as a noble, but necessity may mean that they descend in social status to become a brigand or mercenary. WHFRP has been released in various iterations by other companies since GW ceased to produce WHRP themselves and licence-out the intellectual property. Most of these reiterations have, in my view, failed to recreate what truly made WHRP special in the first place; but I’m happy to see that Cubical 7 have seen fit to – despite one or two re-tweaks and revisions – reproduced WHRP in its original form in style of rules, tone, style and setting. Great game, if you’ve never played, buy it now.